Rocky was sent this cool Ben and Holly plates this week and as we'd just watched it as it was delivered the joy on his face was as if magic had truly just happened. Sadly I didn't manage to get that on film as the postman gave it straight to him and it was open before I could say Elf Tree but we did get a few snaps as he began to play. 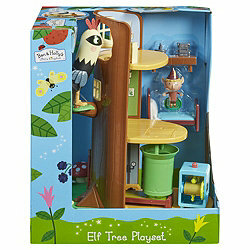 Have fantastic 'Elf' fun in this amazing Elf Tree Playset. 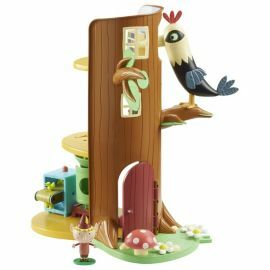 Includes rocking woodpecker, Ben Elf's bedroom, the workshop with trap door and elf toy factory. If you don't know the story of Ben & Holly check out their Website here - Ben & Holly TV - but in a nutshell Ben is an Elf and Holly is a Fairy and they live in a magic wood. It's a TV programme for kids and has been around for years now, successfully and magically capturing little minds to give their parents a bit of peace. This playset is one in a long line of Ben & Holly toys that kids will love. The Elf Tree has many moveable pieces yet is pretty simple for little fingers. It is fantastic for imagination play they can sit and act out the stories they've just seen on their favourite programme; giving the parents even longer to get their jobs done in peace. Rocky has played none stop whilst I have been writing this review and for that I am truly grateful. There are a few small pieces so the age of the toy is dependable on whether they're trusted not to eat them. Over all I think this toy is perfect for any little Ben or Holly out there and will be a happy addition to our toy shelf. Lots of magical & exciting play features! Hatch down to Toy Factory. Move the ducks on the conveyor belt! Includes Barnaby Elf figure with detachable base. Not suitable for children under 36 months. Choking hazard (small parts and small balls).